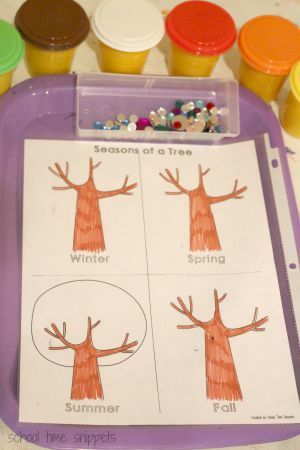 Explore the changes of a tree through spring, summer, fall, and winter with your toddler, preschooler, and/or Kindergartners with this seasons worksheet. 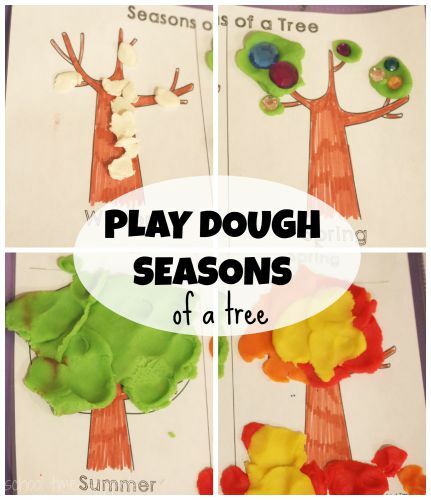 Your child will love this visual, hands-on activity using playdough to learn about the way a tree changes through the seasons! With the Fall Season right around the corner, we recently talked about the changing of the seasons and how the seasons affect the trees around us with my two preschoolers. A lovely go-along book we read was, Tap the Magic Tree. It is a wonderful interactive book exploring the way a tree changes through the seasons. 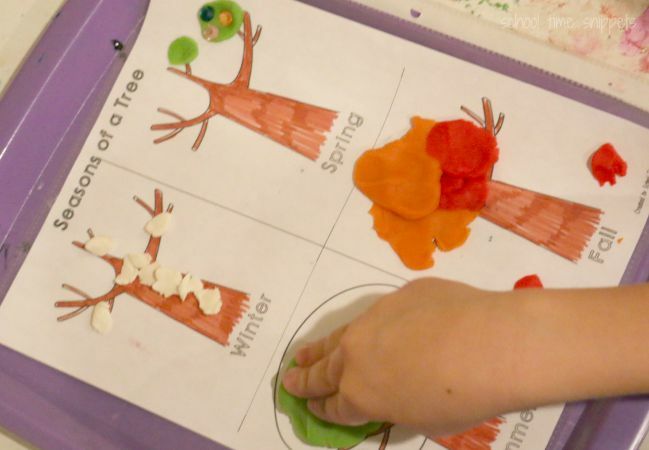 To explore the seasons of a tree during National Play Dough Month, we enjoyed building the seasons of a tree on our printable worksheet, with playdough of course! This hands-on activity is a simple idea to add to your preschool seasons theme! Just download the seasons worksheet and break out the play dough! Once the activity mat is printed, place in a sheet protector or laminate for durability. Laminating allows you to keep the activity on your preschool learning shelf for a few extra days. Read a book or two about seasons, and have fun! 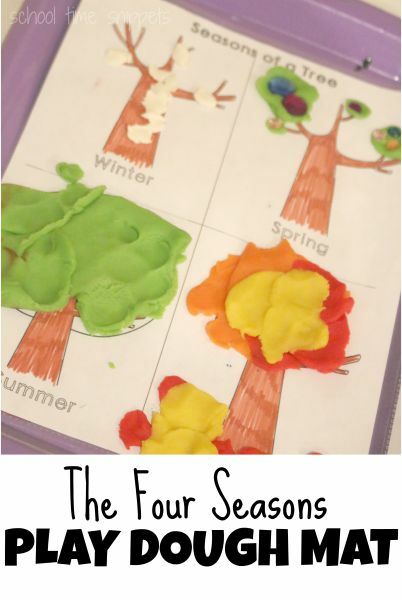 Talk about how the trees look in each season and use play dough to re-create the seasons on our printable seasons worksheet. For winter, we added flattened balls of "snow." For spring, we made small flattened circles and added some sparkly sequins to represent the spring buds. For summer, we filled the whole top of the tree with green playdough. For fall, we added orange, red, and yellow play dough to represent the changing leaves. My little ones loved this hands-on activity exploring the four seasons! Looking for more ways to teach your preschooler about the four seasons? 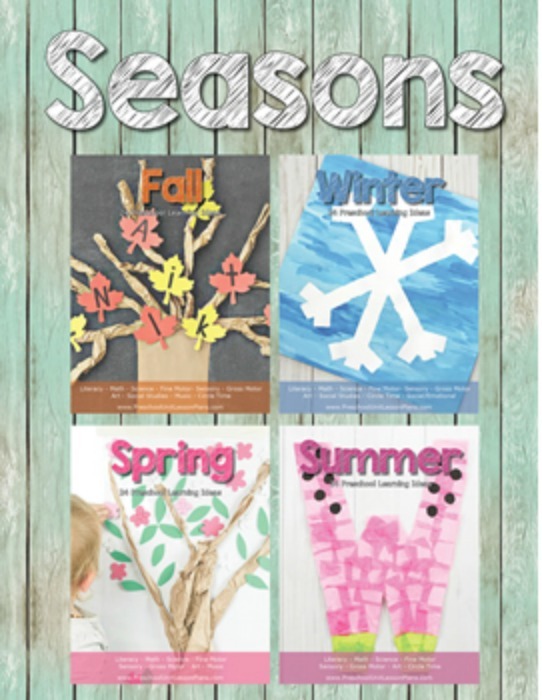 You might like our 4 Seasons Preschool Unit Lesson Plans! Each unit in this liteature based preschool curriculum has 24 tried and true activities to teach your preschooler various skills in math, literacy, art, sensory experiences, & more! !